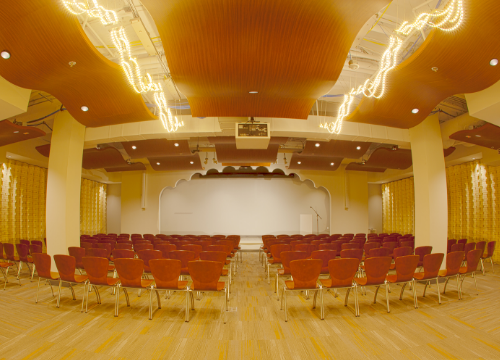 With its ornate lighting and vintage brick siding, the Lecture Hall is a unique and eclectic location. Equipped with 12, 60 inch round tables and 145 chairs, this room can host everything from a full-day workshop to a wedding reception. The attached catering kitchen comes equipped with two hot food cabinets, two fridges, a small ice machine, and plenty of counter space. 2 Inputs (VGA, HDMI, 1/8’ Audio): Users will be able to present from their laptop to the projector and screen. Cancellation Policies: 5 business days. Can I prepare my food in the catering kitchen? The catering kitchen is not a full service kitchen. It comes equipped with 2 fridges, 2 hot food holders, 2 dishwashers, a microwave, and a sink. You are welcome to bring in a skillet but nothing that uses an open flame. Our Center Animator will be available to assist you with any technology needs you may have before and during your event. This services comes included with your reservation fee. How do I get more tables into the room? We have two additional tables available for each room upon request. If you require more, please contact the Center Animator (IAlvarez@NonprofitCtr.Org) prior to the day of your event.